The National Network of Women Human Rights Defenders in Honduras hereby expresses our deepest indignation over the use of the words and image of our sister and compañera in struggle, Berta Cáceres, by the illegitimate ruling government of this country. With regards to a date designated by indigenous peoples, the Ministry of Foreign Affairs has cynically used Berta’s ideas to imply that the government is democratic at the same time that it legalizes projects of death for indigenous peoples and justifies the surrender of their territories with the law requiring free, prior and informed consultation; this, in reality cripples the autonomy, culture, food sources and general welfare of the peoples. Just as representatives of different sectors have been doing in different ways, these government agents are deceitfully using Berta’s image, which belongs to the people for whom she struggled, including many women defenders and feminists. We who do have moral authority delegitimize this use of her image by interests with the same values that Berta combatted during her life, leading to her assassination: the market, racism, exploitation, and humilliation of the most ancient peoples in this country, who should be governing it. As her sisters, we reject and abort those who use her words and strugge to defile her. 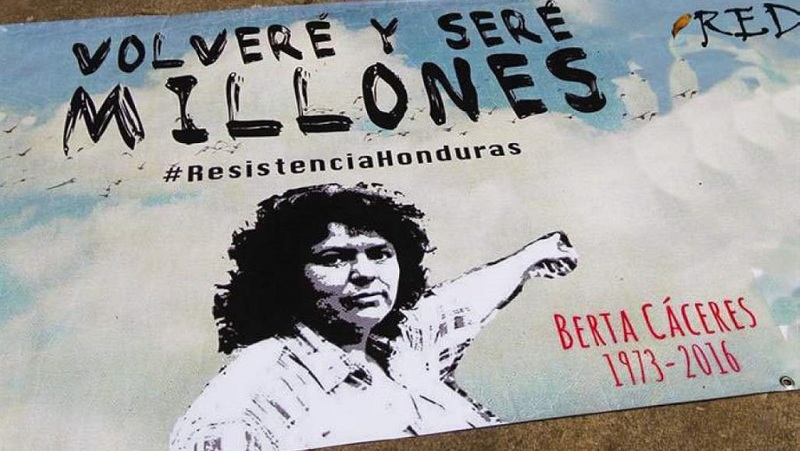 We sound the alert to the Honduran people who identify with Berta’s rebelliousness that in the days to come, it will be highly important to do justice for the crime against her and the Lenca communities and all the people debased by the government’s injustice, which oppresses, kills and imprisons defenders and social activists. It is precisely this government and all the beneficiaries of the coup d’état of 2009 who are hindering the efforts to clarify exactly what happened to Berta and identify the intellectual autors of her assassination. By the same token, entities of this impostor government are the ones who sustain projects of death, such as Agua Zarca, which still exists due to the impunity granted it for spilling the blood of Berta, Tomás, Paula and other comrades in communities that struggle. And these authorities are the ones who save corrupt politicians and their associates, whose hands are full of the hard-earned people’s money, much needed to dignify their everyday lives. We tell you now that from our position as defenders of life, autonomy, peoples’ sovereignty and women’s bodies, that we will not allow these agents to use Berta to cover up their business of death and dispossession of the peoples. With the force of Berta Cáceres and all of our ancestors assassinated by the racist, neoliberal patriarchy, we will continue the struggle for all women defenders to live and live well.